News,Solesee has sold over 1300 potentially limb saving devices in just over 3 years. Over 1300 Solesee Foot Inspection Mirrors have been sold since we started the business just over 3 years ago! That is over 1300 people with diabetes who, empowered by our simple but effective device, are now taking control of their foot health. With this device they are able to look independently and easily at the soles of their feet to check for changes, as part of their daily foot routine. Using Solesee daily, if you have diabetes, is a huge step towards self-management of your foot health. It gives purpose and confidence to those using it. The booklet which accompanies the mirror, gives guidelines on what specific changes to look out for, as well as explaining why people with diabetes should take special care of their feet. After talking to many podiatrists, they would advise a trip to see them if patients see anything different on their feet at all. If problems are caught early enough there is less chance of it developing into anything more serious. Sales have come from all over the UK as well as from the USA, Australia and The Netherlands. It is stocked by Diabetes UK, IDDT, Amazon, Rompa, Spring Chicken, Connect2Pharma and DiabeticSupply, all online, plus of course our own Solesee website. ShoeMed Stratford, ShoeMed Clitheroe and a growing number of podiatrists also stock the product. We are looking to build on this success by continuing to talk about the importance of daily foot checks as well as spreading awareness of Solesee. We want to ensure that anyone with diabetes knows there’s a device which has specifically designed to help them with this very important check. 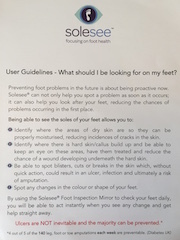 We are also speaking to podiatrists all over the UK, so that they are aware of Solesee to recommend to their patients as well as using it in their surgeries as part of their daily kit. If 80% of amputations due to diabetes related complications are preventable, we are proud to think that someone who bought a Solesee and has used it daily has maybe spotted a change, asked for help and prevented themselves from a potentially catastrophic foot problem. Ulcers and amputations are NOT inevitable, and the majority can be prevented.